In the complex world we live in, the demand for visual prototyping and visual analysis is considerable. The human visual system is the highest bandwidth mechanism for driving and understanding complex information. For studios and gaming industries, images have to be physically accurate, photorealistic, and made with high-fidelity material properties. Not only for the entertainment industry, excellent image fidelity also plays an important role in industries such as architecture, medicine, and engineering to make complex data intelligible. However, as data size increases significantly, the limitations of graphics-processing hardware makes visualizing data at large scale a significant challenge. While interactive visual computing of large 3D data is becoming critical in many industries, reducing system costs also becomes a significant factor when making decisions. However, a breakthrough has emerged: Ray tracing techniques, provided by Intel® Rendering Framework, handles large datasets, offers high fidelity visualizations, is optimized for parallel processing architectures, and is open source, thus providing a significant alternative to graphics hardware. Ray tracing performance on graphics hardware proves to be a significant challenge when the data size is too large to fit into limited GPU memory. Intel® Xeon® Scalable processor based implementations, utilizing its inherent parallel processing features, enable leading performance that is often competitive with traditional hardware-accelerated, rasterized triangle rendering. The technical solutions available with GPU-based rendering no longer provide a strong balance between performance, visual fidelity, and cost. 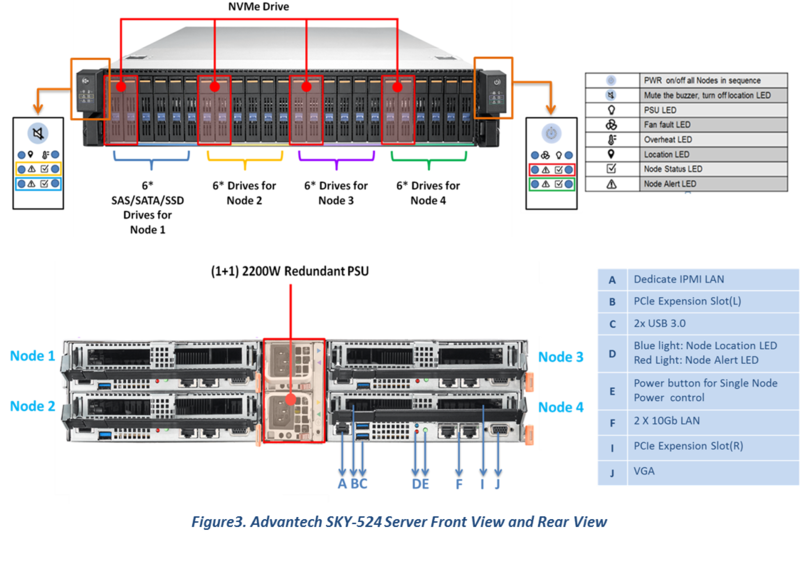 Advantech has chosen to partner with Intel to verify its HPC-8212 and ASMB-925 server board and SKY-524 server as Intel® Select Solutions for Professional Visualization. This enables users of the systems to benefit from Intel’s experience in simulation, modeling and visualization markets with workload-optimized performance from Intel Xeon Scalable processors. Intel Select Solutions for Professional Visualization provide a fast path for purchasing and deploying a cluster to enable compute and visualization workloads with less cost, limitations, and system challenges. Intel Select Solutions for Professional Visualization consist of a pre-validated selection of software and hardware components designed to meet the demands of HPC and enterprise applications that include visualization workflows. These systems also provide the capabilities and agility needed to eliminate the need for multiple single-purpose systems. In addition, the performance of key system characteristics is verified for Intel Select Solutions for Professional Visualization at both the node and cluster level. Infrastructure solutions are a key target for today’s complex workloads, based on Intel® Xeon® Scalable processors with high speed network interconnects. 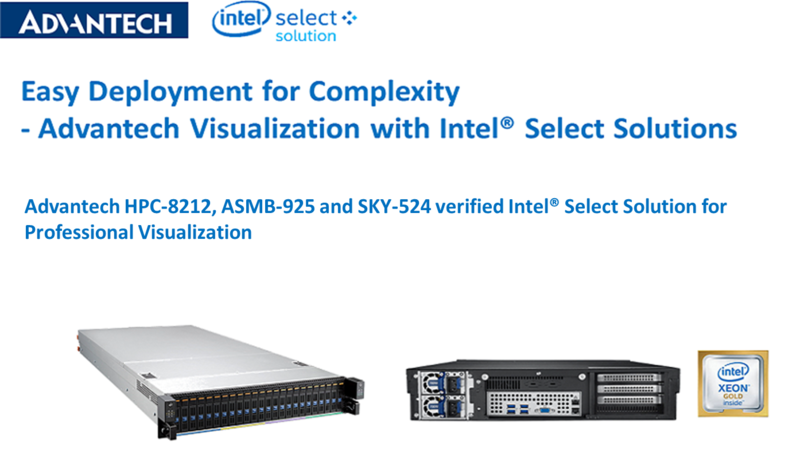 Also, the new Intel Select Solution for Professional Visualization eases multiple customers and end users through complex selection processes to help them make smarter and faster price-performance choices based on data. The Intel Select Solution for Professional Visualization performance requirements have been established using HPL, HPCG, DGEMM, STREAM, IMB PingPong, OSPRay, and ParaView benchmarks. Intel Select Solutions consists of select hardware, various Intel® Xeon® processor technologies, Intel® Omni-Path interconnect along with optimized software and firmware configurations. It consists of the following components. 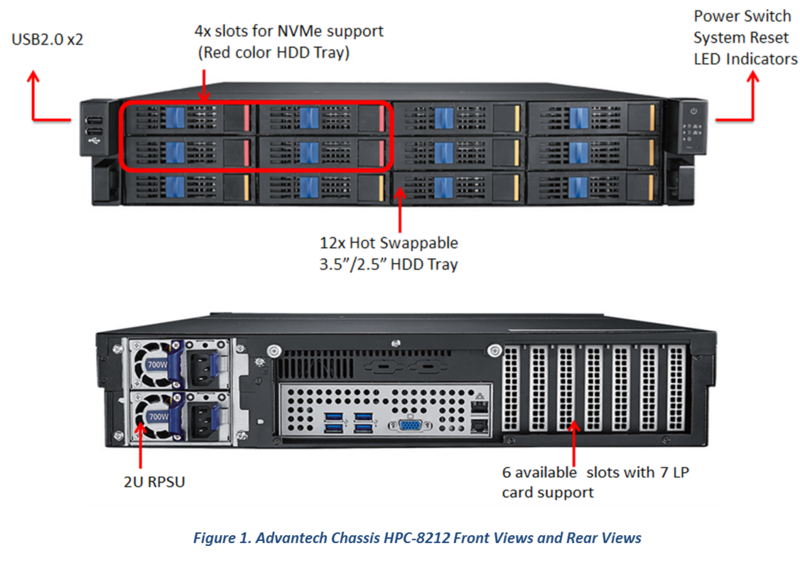 The system must be comprised of at least one Frontend node (Advantech HPC-8212 Chassis + ASMB-925 Serverboard) and 3 Compute nodes (Advantech SKY-524). The HPC-8212 series are 2U storage chassis with 12 3.5” hot-pluggable HDD bays designed for NVR and CMS servers to support digital surveillance and cloud storage applications. Following the latest industrial design concepts, HPC-8212 provides users with high-performance computing in a state-of-the-art platform. The highly efficient switch-mode power supply and easy-to-maintain cooling fans enable HPC-8212 to support diverse EATX/ATX/micro ATX motherboards. The platform’s next-generation SAS 12 Gbp backplane with 4-port NVMe interface offers premium storage performance with the inclusion of a SAS12G RAID card or optional NVMe riser card. Additionally, the chassis features a 7-slot low-profile I/O bracket in the rear panel as the default, and can be fitted with optional 3-slot full-height I/O brackets. The HPC8212 series also supports a wide input power range and a 550W to 800W redundant power supply. 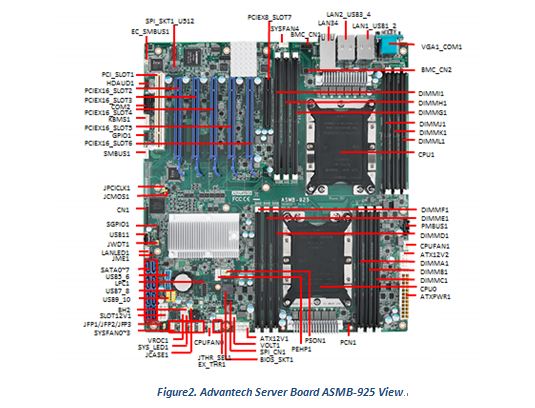 The ASMB-925 server board is the most advanced Intel Xeon Processor scalable family series board for server-grade IPC applications that require high-performance computing power & multi-expansion slots. This server board supports Intel Xeon Scalable series processor and DDR4 ECC-REG 2133/2400/2666 MHz memory up to 768 GB. One of RJ-45 LAN connector (LAN2) is shared for IPMI function that allows remote control management. High reliability and outstanding performance makes ASMB-925 the ideal platform for industrial server/networking applications. By using the Intel C621/C622 chipset, the ASMB-925 offers a variety of features such as 6 x USB3.0 and 5 x USB 2.0 connectivity, 8 x onboard SATA III. It supports software RAID 0, 1, 10 and 5 (Windows only*), and with the latest Intel RSTe (Rapid Storage Technology Enterprise) it provides a compelling RAID solution for NVMe SSDs via Intel VROC (Virtual RAID on CPU) HW key. These powerful I/O capabilities ensure even more reliable data storage capabilities and high-speed I/O peripheral connectivity. The Advantech SKY-524 server, it is a highly configurable high performance server designed to balance server-class processing with flexible I/O and offload density in a 20" depth chassis. It is specifically designed for high density PCIe card payloads where maximum I/O connectivity is needed or the integration of industry leading offload and acceleration technology is essential. Equipped with flexible I/O options, it is easy to upgrade to 1G/10G/40G/100G LAN via daughter boards. Hotline: Europe: 00-800-24-26-80-80 | USA: 1-800-205-7940.